Recently a customer asked if we have an add-in that deals with Junk Mail. 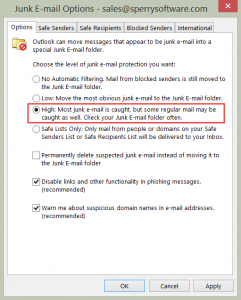 We don’t have one that directly addresses junk mail because Outlook’s Junk Mail filter is pretty strong so perhaps it’s just not setup right. In general though, Outlook’s Junk Mail feature learns over time so if your Outlook installation is new give it a few weeks before you pass judgement. These are the default settings at Sperry Software. 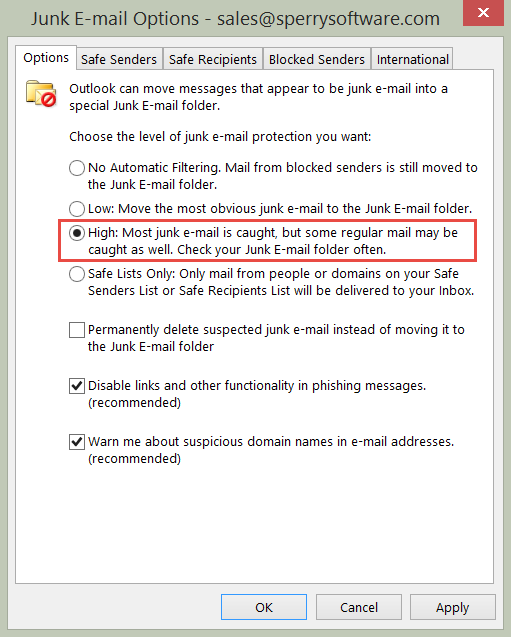 The “High” option should be used to prevent the most amount of junk mail from reaching your Inbox. When we did this for our main mailbox, the problem was that too much “valid” email from customers was ending up in the Junk Mail folder. So what we did was use a Sperry Software add-in to occasionally scan the Junk Mail folder for these emails, the Timed Email Organizer. A rule was created within the add-in that took some of the most common words that customers use (for instance the names of the add-ins) and move them back to the Inbox. So if the email has words like “add-in”, “addin”, or “Outlook”, even though it was in the Junk Mail folder, after a few minutes the add-in would move it back to the Inbox. One other note: since the Timed Email Organizer supports keywords like AND, OR, and NOT in the subject and body, you can form powerful combinations of words to fit your situation like we did. While we still have to occasionally check the Junk Mail folder for emails from customers, it’s the best solution we’ve come up with to be able to accept emails from people that aren’t in our Safe Senders list (i.e., customers who have never emailed us before). Message, Tips Timed Email Organizer. permalink.